Brush each of the slices of peach with olive oil. Over a medium grill (or if you don’t have a grill you can use a grill pan), set the peaches and allow them to grill for 1 to 2 minutes per side. Add the goat cheese, cream cheese, heavy cream, 1 teaspoon of olive oil and salt to a food processor. Pulse until smooth, light and fluffy. If you like, you can toast the bread or rub it with a bit of garlic. Smother each of the bread slices with a teaspoon or two of the whipped goat cheese. 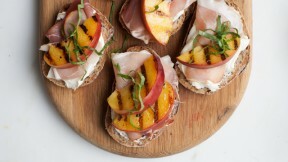 Top with a slice of prosciutto, a few grilled peach slices and basil.